A set of 260 single-view mammograms with calcification clusters was first used for the validation of the CADiagnosis algorithm described previously. The set included 138 calcification clusters associated with benign disease that are commonly referred to as benign calcifications or clusters and 122 calcification clusters associated with cancer that are commonly referred to as malignant calcifications or clusters. All mammograms were selected from the patient files of the H. Lee Moffitt Cancer Center & Research Institute at the University of South Florida. Original mammograms were acquired on two different mammography systems, both accredited by the American College of Radiology (ACR) and having similar performances. A DuPont Microvision film combined with a Kodak Min-R (one-sided) screen was used for all mammograms. Films were digitized with a DBA (DBA Inc., Melbourne, FL) ImagClear R3000 CCD-based film digitizer with a pixel size of 30 ^m, a pixel depth of 16 bits, and a nonlinear response to optical density . Full images were resized to 60 ^m by mathematical interpolation keeping the pixel depth the same. For this application, 512 x 512 pixel ROIs were processed. ROIs were selected from the full 60 ^m images to contain the calcification cluster of interest. 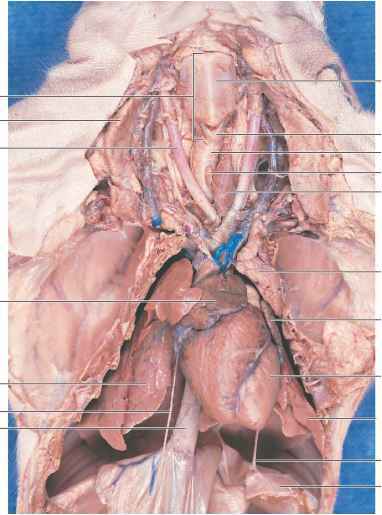 Mammographic views were either cranio-caudal (CC) or medio-lateral oblique (MLO) views of the right of left breast. Two hundred two (202) views from this set were images of the same cluster that is they were CC and MLO views of the same breast and the same patient. For this application, however, they were considered as independent samples. This is common practice in the field not only because of the rarity of the data but also because most CADetec-tion schemes today are applied to single views only and do not usually consider the full mammogram or the "other" breast view in the process. A bias is certainly expected when views from the same patient and of the same cluster are treated as independent samples and this bias could affect performance. This is investigated in the following application example described in section 13.6.2. Figure 13.16: Computer ROC plots of the TPF and FPF pairs obtained from the classification of 260 clusters. 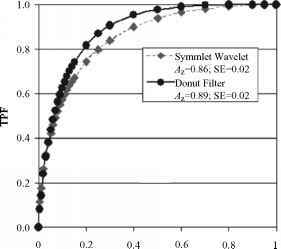 The dashed curve corresponds to the results obtained with the symmlet wavelet filter and the solid curve corresponds to the results obtained with the donut filter. The estimated area indices AZ and corresponding SE values are included in the insert. ing that cluster classification using the donut filter in the detection and segmentation stage was significantly better than classification using the symmlet wavelet.